Many photographers, it seems to me, are more interested in equipment than in photography. I don’t feel I have enough knowledge about photo gear, or a distinct enough voice, to make myself heard above the mass of reviews available elsewhere on the internet. But in the case of the Uniqball tripod head I recently purchased, I’m going to make an exception. So those of you interested in the images themselves and the subject matter, rather than what gear they were made with, might want to skip this post! The Uniqball range of tripod heads were developed in Hungary by bird photographers and are still made there. They have received good reviews in the UK, notably from the wildlife photographer Andy Rouse. However, as he is one of the company’s very few agents here, it might be wise to take his recommendations with a pinch of salt. Late last year, though, the Uniqball was recognised in the “accessory” category of 2015 TIPA Product of the Year Awards – “…. the most influential photo and imaging product awards around the world”. So the Uniqball must do something well! I thought it wise to investigate the Uniqball again more thoroughly. If you’re a bird photographer your long lens almost certainly has a loosely-fitting lens collar (within which the lens can rotate) and a foot running parallel with the lens axis. If you’re a landscape photographer your lens is fixed to the camera body and the body is attached to the tripod head either directly or using a L-plate (see above), running at right-angles to the lens axis. b) inserting a right-angle adaptor (supplied with the head) into the clamp. Neither solution appealed to me. Do small gizmos, tools and gadgets get lost? Yes, they do. Would I ever want to change from long lens use to standard lens in a hurry? Yes, sometimes. Any thought of purchasing a Uniqball was therefore put on hold. But this spring I discovered that a new model was shortly due to be launched which also featured an “ultra-light panoramic clamp”. In other words the clamp could be rotated 90 degrees in a jiffy (or the full 360 degrees if required). I didn’t waste a moment in ordering one and must have had one of the first in the UK. In a general sense this is one very attractive looking piece of equipment. It is very lightweight, noticeably less heavy in the field than the mid-range ball head I had previously been using. It is finished to a very high standard, although how well this finish will last after a couple of years use and misuse only time will tell. Some complaints were made of the earlier models that tightening up the inner ball caused the image to shift upwards by a degree or two. This has not been fixed in the UB35P. Once the outer ball has been set using the spirit level, a Uniqball acts as a pan-and-tilt head, which is actually less flexible than a ball-head. One is restricted to horizontal and vertical movements. This would seem to be a disadvantage in most situations, to my eyes anyway. Apart from this, then, what is my experience of using one in the field? I’ll answer this from two points of view – the long-lens user and the L-plate user. The bird photographer can ‘work around’ the apparent disadvantage noted in the previous paragraph by slackening off the lens collar and rotating the lens as required. If a correct horizon is needed this won’t help but in real life how often do we actually need a correct horizon when photographing wildlife? Panning, tilting and rotating the lens gives almost as much flexibility as a gimbal head with lens collar released – although I can’t be sure of this from personal experience. Using the UB35P in this way is an absolute delight, and has one big advantage over a ball head: it will not collapse over to one side, potentially causing damage to equipment and fingers, if the ball is not fully tightened. The upward shift in composition IS particularly noticeable, of course, using a long lens, and the bird photographer will just have to deal with it. But, on balance, it’s a thumbs-up for the UB35P for use in wildlife photography. The landscape photographer using the UB35P has a different issue to deal with. It is impossible to rotate the lens, because it is fixed to the camera body. One is thus restricted to pan and tilt movements once the horizon has been set. So one either accepts this limitation or, as the manufacturer suggests, uses the outer ball to compose the image. The problem with doing the latter is that the outer ball does not really have variable friction control. It’s basically on or off. So once again it’s a bit of a ‘work-around’. However I feel sure that with time and experience using the Uniqball will become second nature. “Image-shift” (mentioned above) is much less of a problem with a wide-angle/standard lenses and I would suggest well within the realms of acceptability. Straight out of the camera many of my landscape images suffer from sloping horizons. They always have, I don’t know what causes it, and until the Uniqball I didn’t know how to fix it. But again I propose the following question: when photographing the landscape, how important is a correct horizon? And further, does the horizon even appear in the image? Speaking personally, it’s not that I look for it particularly, but the horizon is the first thing I notice in a landscape image. In other situations, in woodland, for example, technically speaking the horizon may not need to be correct; as long as the image “looks right” I’m happy . It is up to the individual to decide how important this feature is to them. The manufacturer claims that the Uniqball is at the same time a gimbal head, a ball head, and a tilt/shift head. I suppose so, but not really a shining example of any of them. Where it comes into its own is that it combines aspects of all three into one unit. 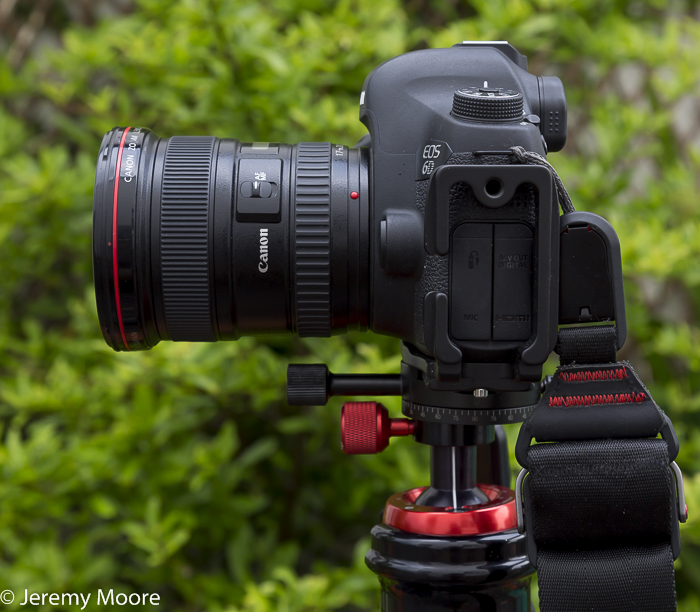 It performs well enough as a gimbal head that many bird photographers will be happy. Landscape photographers will adapt to using it, even if its functionality is a bit limited. For many years as a landscape photographer I used a Novoflex Magicball which really was my flexible friend. One control did everything. I would still be using it today if it could cope with the weight of a long zoom lens without slipping. I rue the day when I had to retire it. My ball head did most things reasonably well. For those who do both landscapes and wildlife, like I now do, the Uniqball UB35P is a very lightweight and versatile piece of kit. While it may always be a niche product, it does have that little bit extra for the discerning user. The UB35P is available direct from the manufacturer and costs roughly £300 including delivery. It is worth noting that in my “copy” there was an unreasonable amount of friction between the screw-in control of the clamp (long and black in the picture above) and the spring-loaded “jaw” which it pushes in. This was sorted with a little lubrication but I suspect adding a tiny washer at that point during manufacture would solve that problem more permanently. Uniqball have offered me a replacement when they have new supplies in stock. UPDATE: I have just (August 16th) received the replacement part from Uniqball as promised. It is from a second batch of Ultralight Panoramic Clamps and as I suggested above features a tiny washer at the base the screw-in control. Definitely a case of “Great minds think alike……” and it was very generous of Uniqball to send me one. This entry was posted in Uncategorized and tagged review, UB35P, Uniqball. Bookmark the permalink.